As we finished Part 1 of the interview, Alan was joining up with the Sheffield United squad for a 4 a.m. jaunt to the airport and a pre-season tour. Although Alan explained how easy a decision it was to join United, establishing himself in the first team didn't look that easy on paper. 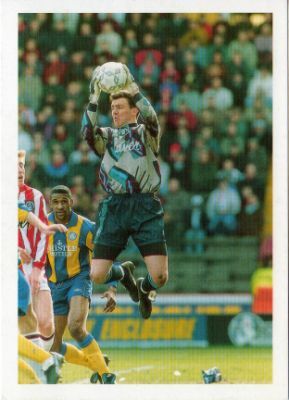 United were blessed with goalkeeping talent around that time; You, Simon Tracey and sadly, only briefly, Mel Rees. Was that something difficult to deal with, or did you thrive under the pressure to perform and keep your place? I knew I was up against some fantastic goalkeeping talent, but with me signing at 4 a.m. in the morning and going straight on a two week tour it was quite a full on intro to my new team mates. Trace was first class, as were all the lads, Simon even gave me a pair of gloves because mine were crap! I still speak to Trace to this day and when you think that it was 20 years this summer since I signed for Sheffield United then that shows how good our team spirit was at that time. He was an amazing man, who was sadly taken from us too soon. I will never forget walking off the pitch at Wembley after the semi- final against Wednesday and seeing Mel stood by the side of the pitch, I walked over to him and we walked off together and if there was any moment in my life when I realised that there were more important things in life than football then that moment was it. For me, the sight of a gaunt and gravely ill Mel Rees walking around the Wembley pitch before the Steel City semi-final is one of the most moving things I have ever seen. Two groups of opposing fans, usually at each other's throats, united in acclaim and emotion. On to the game and the Steel City semi-final was one of your greatest United performances for me. Several world-class saves, yet people will always remember and TV will always show Waddle's free kick. That must grate a little bit? Not at all, it was a great finish, from a great player. From my point of view I was stood in a decent position, but as soon as it left Chris Waddle's boot I knew I was in trouble, such was the quality of the strike. The free kick was awarded after 36 seconds from a long kick by Chris Woods and I wanted two in the wall as the ball was 30 yards or so out. Mitch Ward was number one in the wall and John Gannon was the other. If you look back at the TV angle from behind the goal, Danny Wilson & John Sheridan are on the ball for the free kick with Wardy & Ganns in the wall, but then Danny moved away & John Gannon's followed him to cover him which left Wardy on his own. Up stepped Waddle and I don’t think he could have hit it better…..but I would say that! I don’t think I would have got it with four in the wall! As I have always said, I couldn’t change the fact that I had conceded the goal in the first minute of a semi-final, whether it was my fault or not, but I could try my best to make sure another one didn’t go in. So I had to put the negative thoughts in a box and get on with it. When Corky (Alan Cork) scored to equalise, I nearly burst a blood vessel. I can’t put into words how special that day was, to see Wembley packed to the rafters with Sheffield fans, to see/hear the reception we got from the Blades fans as we walked out from the tunnel (it ade the hairs on the back of your neck stand up, I actually felt 10 feet tall ) and to be fair the Wednesday fans gave it socks as well. It was one of only a few games I experienced where the atmosphere, the colour, the balloons, the noise and the whole occasion, took you to another level …….. the only downside was the result. We hear much about the tremendous camaraderie and team spirit that Dave Bassett generated at Bramall Lane, you touché don it before, are there any stand-out memories of that time? I think Harry’s secret was putting together a bunch of lads who worked hard, who were strong characters, with good ability and who knew how lucky they were to play football. Add to that a good mix of home grown talent in Carl Bradshaw, Mitch Ward and Sid (Dane) Whitehouse and the result was a real connection between the crowd and the players. When you look at how many of the players from the early-90's who still live in and around Sheffield to this day, it tells you how they took to the city and how the city took to them. I read the article from Giacomo Squintani about the Anglo Italian Cup. I have to say that witnessing player after player being sent off and then seeing Harry’s reaction - which led to him being sent off - was one of the funniest things I have ever seen. It was broadcast on Calendar (Yorkshire TV's local news programme) the next day and the reporter.....he was lost for words after the video was played! Another memory…..seeing one of our players dancing naked through the foyer of a hotel singing “I am the Lord of the Dance said he” with a roll of flaming toilet paper attached to his bottom…..that's a moment that springs to mind!! It wasn't just the players though. Mick Rooker, Mary and Sue, Derek Dooley, Dawn “One Lamb Lunch” and all concerned with the club at the time helped to make the togetherness and camaraderie of the place what it was. We used to have a pint in the social club under the South Stand when we came back from away games….can you imagine that now? As a keeper you are placed in a position where mistakes (albeit rare in your case) have a significant impact on the game. How did you deal with them? When you make a mistake, you can’t turn the clock back,. The ball is in the net and there is nothing you can do about that, other than make sure that it doesn’t happen again. You cannot sulk or go to pieces, because that would be letting the rest of the players, fans and the club down again. You have to quickly work out why it happened, put your hand up to acknowledge it was your fault and move on. I remember a mistake in front of the Kop at Bramall Lane against West Brom. Chris Wilder passed the ball back to me from the left back position, but the West Brom centre forwards -, Hunt and Hughes - read the back pass & were bearing down on me…. My head is saying kick the ball out of play, but my former outfield persona is saying “Go on, dribble around them” - so off I go. I dropped my shoulder and went around Hunt and, with just Hughes to get around next, I decided to try a crazy reverse pass back to full back Chris Wilder. So, there I am, about to perform this pass about 10 yards from goal. I planted my foot, it gave way, I fell over the ball and Lee Hughes had the easiest open goal ever! Now that was the longest walk back to get the ball out of the net that I have ever done. But as I was walking back I thought, 'I've got to acknowledge such a massive clanger', so I held my hands up to the Kop and said “Sorry”. To be fair, the response was fantastic. If you make a mistake, hold your hands up and most people will forgive you, but only if you make them every now and then! The other standout games of your time with United for me are the shootout victories over Blackburn and Coventry. As a keeper, how do you approach a shootout? It’s a no lose situation for a goalkeeper. I always used to try and appear confident, big but not dancing around on the line. That's because I wanted the opposing player to look at me as someone who was imposing and in control….it only used to happen in FA Cup shoot-outs though! Oh, and you need to be a good guesser!! I think the fact that the Blackburn and Coventry penalty shoot outs were in replays back at the Lane made the occasions special. I loved playing at Beautiful Downtown Bramall Lane. Pulling up to the imposing South Stand, running out of the tunnel and the reception from the Blades fans was always fantastic. To top it off, the best song in football “The Greasy Chip Butty Song”.......brilliant!! What are your memories of the Coventry replay? I remember being at Highfield Road for the first game. Your saves kept us in it that day and then Petr Katchouro nearly nicked it for us at the end. I think the result we got at Coventry (1-1 draw) was a great performance from the lads, after being under siege for large parts of the game. Marcelo popped up with the equaliser and ripped off his shirt and threw it to the Blades fans. He must have been confident of scoring because he had a replacement shirt underneath his original! Dion Dublin was first up for Coventry and I knew he would place his spot kick in the same place as he had in the original game. As he ran up I was already diving to my left with a massive grin on my face and made the save, the feeling of knowing you went the right way was pure joy! The rest of the shootout went in a flash and as I stood there, in front of the Kop, watching Wayne Quinn step up to take the pen that would see us through to another semi-final, it was a brilliant feeling! I knew Quinny would score because he had such a sweet left foot. When he did, the whole place went bonkers! I found myself being carried up and along in a scene of relief, unbridled joy and celebration at a fantastic result. It was also Paddy’s night but, by the time I got back to the changing room and up to the bar, it was shut! I always think they have a more special feel due to being night games under the lights. Would you agree? Night games always have that special feel to them and when you look back at some of the great memorable games they all seem to happen at night, the cup shoot –outs, beating Arsenal in a replay, knocking six past Tottenham! All were great games. In the final part that you can read here, Alan talks about leaving Bramall Lane, his time at Blackburn and international honours. Really great, thanks so much! fantastic read. cant wait for Pt3. although was suprised that the David Barnes incident on the bus to Sweden wasn't included (probably cos its already in a book) keep up the good work pal and, Alan, you're a proper legend! My fave pleayer of all time - in front of Deane, Agana, Whitehouse...just!! !